(Phys.org) —Japanese construction firm Shimizu Corp. has unveiled a proposal that entails building a solar panel array around the moon's equator, then sending the power it collects back to Earth. They are calling the project LUNA RING. Since the earthquake and tsunami that struck Japan back in March 2011 (which led to closing the country's nuclear power plants) scientists there (and elsewhere) have been scrambling to find ways to create electricity for the country in other ways. In this latest proposal, a private company is reaching, quite literally, for the sky. The idea, company reps say, is to lay down a band of concrete (which can be made from moon soil) 250 miles wide all the way around the moon's equator (a distance of approximately 6,800 miles), using robots directed by humans back here on Earth. Next, the concrete would be covered with solar panels, which would be connected via cables to microwave and laser transmission stations. The energy beams sent from the moon would be directed at receiving stations on Earth, allowing for a round-the-clock source of energy as there are no clouds or other bad weather on the moon. Shimizu claims that such a system would be capable of sending 13,000 terawatts of power back to Earth and that construction could begin on the project as early as 2035. Not addressed are the costs and considerable hurdles such a project would have to overcome—foremost among them would be building such a massive structure from such a great distance—nothing like it has ever been attempted. 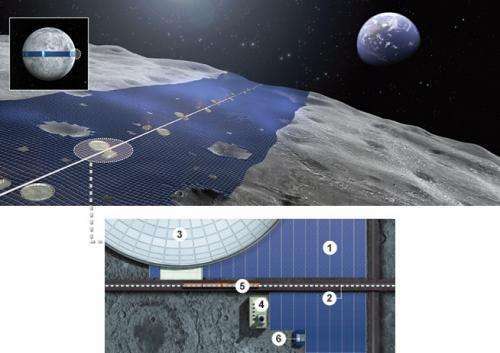 There are also issues of getting the international community to go along with the project and overcoming seemingly simple problems, such as lunar soil disrupting the robots and their construction efforts—not to mention dusting the solar cells once in place. It's quite possible that Shimizu has no intention of actually attempting to carry out its proposed project, but is instead using it as showcase to demonstrate the great lengths it and the country are willing to go to restore the electrical infrastructure of their country. It's also possible that other, less difficult projects or new technologies could make the construction of LUNA RING moot by the time the company is ready to start building it. Wouldn't it be simpler to put those solar panels on the pacific ocean? Ah. Cost and technology. It's those 'minor' details one should consider before proposing such a system. No. Really? Whatever gave you that idea? Something without a tech-idea nor a financing estimate? How could anyone think that that isn't serious? This is silly. For much less, the company could build a magnetic launcher to put (lunar produced) solar cells and microwave transmitters in geosynchronous Earth orbit. Now you have reduced the distance the power has to be transmitted by a factor of ten and doubled the energy acquired per solar cell. Also, you could put in concentrators in either system, but they will also be easier to operate in Earth orbit. 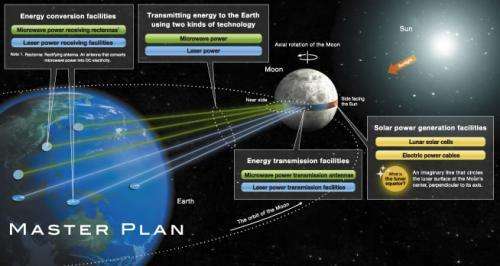 Finally, the moon would only be in position to transmit power to Japan less than half the time. Sending power more than a thousand miles on the Earth's surface is a non-starter--and this system would need much longer transmission lines. You could relay it through satellites, but why not put the solar arrays there in the first place? Why the moon? The sun already produces all the energy one could use and transmits it to earth, all free. How we retrieve it and use it is our present problem!!! The technology challenge is here on Earth not out there. Building on the moon would be more cost effective as there would be no need to waste energy moving mass off of the moon. Photons are less affected by gravity. As mentioned, robot construction techniques would use native raw materials and keep them in the gravity well. Operations and maintenance would be easier for humans and humans would be better protected from radiation on a lunar base. An added feature would be a manned presence for other activities such as large radio and optical telescopes on the dark side. And, one other added feature could be laser defense systems to push asteroids away. And then, why not laser ballistic missile defenses for all? Don't get me wrong, I would love to see a telescope(s) constructed on the moon. But ya misspoke there, there is no "dark side" on the moon. No more than there is a "dark side" on Earth. I think ya might have meant "far side". The problem with placing a telescope on the "far side" would be transferring the imagining back to Earth in real time. One hundred years ago no one could have believed that the interstate highway system would have been possible. Robotics and AI will make construction projects such as this lunar project easy. Why blast lunar material into orbit when it would be far easier and cheaper to use it in situ? You need to mine it and process it on the surface. The array will need to be serviced, repaired, and replaced. Much easier to do this in proximity to the raw materials. Develop Japan's solar, wind and geothermal potential. Spend some money on storage, including electricity -> liquid fuel for deep backup as needed. Japan has good offshore wind potential to the east and good solar in their southern islands. With wind and solar now reaching ~5c/kWh and apparently cheap storage on the way I'm betting on the KISS solutions. Yeah, that's your typical response. And wrong for the same reason as always. By the time this is possible, it will be obsolete due to some technology that you or anyone else hasn't even imagined yet. You mention the freeway system, but I could just as easily mention a hundred thousand other things that were dreamed of 100 years ago but never came to pass due to the fact that they became impractical before they became possible. Stick to shorter term realizable goals, which there are plenty of. The most affordable solution? Highly unlikely. Fun to think about? Sure. Now back on Earth. Japan has its first floating wind turbines in the water and they are installing a lot of solar. The far side of the moon is dark to radio interference from earth. Are they asking you for money or taxing you for it? Aah, do ya realize how large radio telescopes are? There is not a significant Earthly interference that would make it cost effective to build a radio telescope array on the moon. Space based telescopes in the radio spectrum have no advantage over an Earth based system. But they they have HUGE disadvantages. Size and system complexity being the most pronounced. It is the lack of an atmosphere that makes gamma, x-ray, UV, optical and infrared placement on the moon a good idea. The additional simplicity, stability and size of collector are other positives for a moon based observatory. "the far side of the moon — the most radio quiet spot in the inner solar system — is finally being taken seriously for a kilometers-wide, low- frequency radio array." "Such a NASA array would electronically-link thousands of dipole antennas spread over a range of five to ten kms and combine their long wavelength signals in a way that would mimic the imaging resolution of one large kms-wide radio telescope." Ya should dig a little deeper than Forbes. A a daydream from a a JPL scientist is not a plan. That was one radio astronomer, of course for the interview he is going to pump up his own "dream" project. The fact still remains, ya can't get that much more by placing a radio telescope array on the moon to justify the expense. The other viewing spectra would get much more benefit from a moon based observatory. To use large radio arrays, ya must be able to precisely steer large antennae, sticking a bunch of rods in the moon isn't radio telescopy. To get any resolution ya have to point them at and move them around your target. It's a "here's a reason to go to the moon", not a very good one at that. If they go to all that effort, why not use it to support life on the moon? The idea of transmitting sufficient power to Earth doesn't sound practical even if possible. Why the angst? If they want to build it-let them. Why did you Yanks go to the moon? Was it all about the profit motive? Was it all about the paper dollar? What is this unhealthy obsession? It is unedifying. Please stop it. It has as much appeal as watching a hobo fondle himself. This mental malaise has become so acute that you cannot even construct a high-speed rail in your own country without everyone sueing everyone else. Get out of the road if you cannot lend a hand. So you're predicting the future now G? I thought that was against your religion. This thing won't be built anyway - environmentalists won't let their lovely moon be defaced like this . And in the end it will be much cheaper to produce that energy other ways. One hundred years ago no one could have believed that the interstate highway system would have been possible. . Nuts. How did those words even come out of your mouth? Completely absurd. I dont think the idea of solar panels on the moon is so outrageous, but the thought that you could somehow beam that energy to earth is unbelievable. Put a boiler, turbine, and generator at the focus. One doesn't need an optically perfect mirror as long as the light hits the boiler. In fact, a perfect focus would probably burn a hole in the boiler. We've been building steam power plants since Mr. Watt invented the steam engine, and they're a lot easier and cheaper than square kilometers of solar cells and the wiring to connect them. There is one big problem with this approach that is easily overlooked and that is problem even with less powerful satellites. That is getting rid of energy to keep some parts cooler. In space only way to lose energy is by radiation. Conduction or convection into surrounding does not work in vacuum. What I meant was that it will be cheaper to produce similar amount of energy at earth than at orbit, because it is really expensive to lift anything to satellite orbits, and more so to moon. Ain't no body here EVER watched 'StarGate SG1'? 18,000,000,000,000,000 Watts would vaporize a large city, cats, rats, people, cockroaches, cars, bars, and all! 'Transmission towers' would be the 'biggest Honkin' Space Guns' ever developed. And the Japanese propose to control it all remotely...maybe by computer over the internets. What a huge tragedy when some Arab Muslim terrorist.....or some Chinese hacker corps takes it over and roasts all of Japan to tempura fritters. On the other hand, the project could become self replicating, with robots making the concrete, fixing themselves, constructing new robots, feeding and supporting human crews in mission critical jobs there....lunar colonies, sports fans! The power generated would power the support staff and replication and construction after a certain interval. It could also mine the He3 on site for fusion power as well. Best use of He3 would be fusion rocket fuel for deeeeeep space exploration and interstellar craft. It promises to get more energy out than we need to feed in. And it has been ignored until now. Yet it really has no exotic parts or materials involved. Boilers in space are the most asinine idea I have ever heard. Water freezes solid in space at -458 degrees fahrenheit! Comic book thinking can only envision boilers and movable parts. Photovoltaic conversion directly from the sun to electric power is best, most efficient, and has the best mean time between failures. Big projects attract empire builders and invite fiascoes of scale. Look at some of the larger nuclear projects where careerist engineering managers and planners ran good ideas into the ground by grandstanding. In space, small, and a LOT of them, is better. The failure of one will not then bring down large systems. Did they get this idea from the onion? "Since the signal the LUNAR team hopes to observe was emitted billions of years ago, it is very faint when viewed from Earth. Terrestrial radio sources, such as FM radio stations, military and commercial satellites, and many others, all interfere with astronomical signals,effectively drowning out the cosmological radiation the team aims to observe. Therefore, the radio sensing equipment must sit on or orbit around the lunar farside, which has been proven to be the only radio-quiet location in the nearby solar system. Designing a lunar telescope has been a dream of many scientists for decades, and the LUNAR team is working on a design that is durable in the lunar environment and cost effective to deploy and operate." "NASA has selected a proposal by an MIT-led team to develop plans for an array of radio telescopes on the far side of the moon that would probe the earliest formation of the basic structures of the universe. The agency announced the selection and 18 others related to future observatories on Friday, Feb.15." "The only place that is totally shielded from both kinds of interference is the far side of the moon, which always faces away from the Earth and therefore is never exposed to terrestrial radio transmissions. " This isn't even feasible on Earth much less the moon. Although given enough time it might be affordable. The only thing is that it will be more efficient on the moon because it has not atmosphere. As to being practical...well even Jim Hansen thinks phasing in solar power realistically is anything but pie in the sky nonsense....and that's here on Earth. And the amount of thought/development/cost estimate they have put into it since then is zilch. but the thought that you could somehow beam that energy to earth is unbelievable. The beaming part is actually the only part of this idea that is perfectly fine and achievable with current tech at realistic cost. Jim Hansen is a climate expert. But he's been demonstrating that he doesn't know a lot about renewable energy. If this project is meant to bring energy to the night-side of the Earth, then a much simpler setup would suffice. We only need two solar stations on the Moon. One near the left edge and one near the right edge of the visible side of the Moon. This would cover all situations where the Moon is visible on the night side of the Earth. There is no need for solar stations on the Far side of the Moon, because when they are in sunshine, the Moon is on the day side of the Earth. If it is feasible to ship significant amounts of power from space to Earth then why not install solar (and other renewables) in best places around the world and beam the power up then back down to where it is needed? Put extra capacity on the ERCOT (Texas) grid, for example, and when supply exceeds local demand beam it up for use wherever it's needed. Then the ERCOT can take back power from some place like Northern Africa when need be. Might be cheaper than large scale storage, especially deep backup. As cheap as solar and wind are getting it probably makes a lot more sense to install extra on Earth and avoid the lift costs. Bob_Wallace: Not a bad idea at all. However, given the size of the receiving antennae most designs call for, the relay satellites would be as big as powersats. I know nothing about the size of the receiving antenna needed so that could be the downfall. The idea of positioning solar panels in orbit and beaming the 24/365 power back to Earth is intriguing. That makes more sense to me than stringing panels across the Moon. What I do know is that the cost of generating electricity with wind and solar is getting cheap. And they should continue to get cheaper. We also seem to have some well priced storage technology coming to market. Unless we find a way to greatly decrease lift costs I don't think space-based electricity generation has much future. -And then what? Convert electricity to microwaves and beam that to earth? Count the conversion steps and you will see that youve lost most of the energy you gathered. There is a possible use for this config though. "A solar thermal rocket is a theoretical spacecraft propulsion system that would make use of solar power to directly heat reaction mass, and therefore would not require an electrical generator like most other forms of solar-powered propulsion do. The rocket would only have to carry the means of capturing solar energy, such as concentrators and mirrors." Unless we get some radical new way of getting stuff cheaply into orbit (like space elevators, railguns, manufacturing of panels from lunar bases ... or other stuff that is still in the mid- to far-term technology-wise) space based solar is a no-go. There's a crucial point backing the idea: all power generating plants occupy (useful) space on Earth, more so photovoltaics. To me, it's logical that a Japananese firm looks for "unlimited free land" where to set panels to get as much electricity as required. Japan future growth is much restricted by having a limited territory. They do not want to emcumber that land (or water) with thousands of solar panels. I do enjoy science fiction, and this project would be any engineers dream (and nightmare). Yet, as many point out, it make more sense to take advantage of more feasible solutions on Earth. VERY BAD idea. Even if possible to do, this energy will be coming from the exterior of the Earth-Sun system and will finish as heat thus boiling the planet. The Earth is in equilibrium with the energy coming from the sun. Part of it is reflected, part emitted out of the system as heat and some warms the planet. Any source of heat/energy from outside this system would be detrimental as it destroys the equilibrium. No matter if it is solar energy collected outside the planet or thermonuclear reaction. It is not "clean" but just another kind of problem. Maybe even bigger than the greenhouse gases. Just cover every roof and shade with solar panels and the problem will be solved. Photovoltaics is a crude parlor trick using one-time, one-way molecular erosion process that NEVER produces it's initial investment energy. Elements with a lightly held, outer shell electron are placed in a grid and exposed to photons which excite the exit of the loose electron. This "creates" a 1.5 volt Direct Current flow of about 1.5 watts per square foot. Boosting this to usable voltage involves transformer losses, inverting to transmissible AC current involves additional losses. See "Green Prince of Darkness....EXPOSED" at the FauxScienceSlayer website and give up on these green meanie schemes. So how come all the players who are currently researching this and investing much money, like japan and NASA and California, haven't done your calcs and quickly given up? Apparently they have different calcs than yours. "On Nov 2, 2012, China proposed space collaboration with India that mentioned SBSP, " . . . may be Space-based Solar Power initiative so that both India and China can work for long term association with proper funding along with other willing space faring nations to bring space solar power to earth." Well the article explained how it's not feasible if you'd read it. I've read it. His basic argument is that at this point in time we get little of our electricity from wind and solar therefore we won't ever get our electricity from wind and solar. Lomborg, the economist, ignores the rapidly falling price of both wind and solar generation. The average selling price for wind in the US during 2011 and 2012 was $0.04/kWh which makes it the cheapest new electricity source. Solar is now selling in the US SW for $0.05/kWh. The price of both will continue to fall. Lomborg sings his tired old tune that we should not install what we have, we should keep using fossil fuels, and try to invent some new source of clean energy. Lomborg give exactly zero reasons why we can't and won't move from fossil fuels to renewables with the technology we now have in hand. Some parts of the world already are doing exactly that. The guy is simply dishonest. I had a similar idea to power an asteroid defense shield. Hopefully they get this done. But if renewables were cheaper, they wouldn't need subsidies, and we wouldn't need climate policies. I'm arguing against your world view, your identity, and your religion. I'm not going to make any progress there. Only you will or won't. You seem like a really nice and intelligent guy, we just won't talk about the environment or renewables because they are ultimate values to you and you've incorporated them into who you think you are. I'm sure we'll be able to talk about other things because I know we share a lot of the same values....heck we share environmentalism as a value just not at the same level. At this point in time wind is selling in the US for 4 cents per kWh. Without subsidies it would be a bit over 5 cents. Solar is selling in the US SW for 5 cents. W/o subsidies a bit over 6 cents. Both of those prices will fall. Subsidies will decrease and disappear. You're asking an emerging technology to compete against subsidized fossil fuels and nuclear coming from paid off plants. Do a fair comparison. Price new solar and new wind against new coal and new nuclear. No subsidies for any. All cover their external costs. The choice would be wind and solar for about 5c/kWh. Coal and nuclear for > 15c/kWh. Were Lomborg, the economist, an honest person he would use accurate numbers and not false comparisons. New stuff coming out of R&D would be wonderful. We should pursue ideas like fusion. But we have no reason to wait for something new to be invented when we have "good enough" in hand. If you read the linked Lomborg article you saw how he used statistics to minimize the role renewables currently play. He argues that since so little of the world's electricity comes from wind and solar that wind and solar aren't solutions. But if you look at places where there have been significant efforts to use renewables the picture looks different. Take Iowa. They currently get 25% of their electricity from wind. And they expect to be getting 50% of their electricity from wind by 2018. South Dakota gets close to 25% of their electricity from wind. Texas gets about 10% of its electricity from wind. The island of Tokelau is 100% solar powered. Germany and Spain are over 3% from solar. Looking at individual areas we see that wind and solar are working. It's just that many parts of the world are getting a slow start. So how come all the players who are currently researching this and investing much money, like japan and NASA and California, haven't done your calcs and quickly given up? Because, as companies, they calculate cost vs. profit instead of energy in vs. energy out? Duh. Why don't you do the energy in/energy out calcs? We know how much energy hits the Earth each day from the Sun and how much says/radiates back out. We know how much electricity the Earth uses each day. That ends up as heat and some is radiated back into space. You could even bring in the amount of heat we gen each day by burning fossil fuels for perspective. That should give some feel for how much beaming in electricity from space/the Moon would add to the system. Both an absolute and relative number. BTW, I can't see any way that any country would get 100% of its electricity from the Moon. Non-stored wind/solar/geothermal/tidal/hydro would almost certainly be cheaper. Moon-beamed would likely be competing with stored wind/solar. That could be only 20% of our total electricity. But there will be international lawsuits demanding that the solar panels will destroy the atheistic view of the moon and no one will ever be able to do anything on the moon that could be visible from earth. Japan and NASA and California aren't companies. Duh. More evidence that you'd rather write than read. The correct answer would be that these entities DO anticipate and expect more economical ways of getting this material into orbit, either from earth or mass drivers on the moon. This was by the way first proposed by Gerard k O'Neill. Ever hear of him? I think Denmark gets about 30% of its power from wind. I also know it pays more than 40 cents per kilowatt hour for electricity. "Green energy is the least predictable kind. Nobody can say for certain when the wind will blow or the sun will shine. A field of solar panels might be cranking out huge amounts of energy one minute and a tiny amount the next if a thick cloud arrives. In many cases, renewable resources exist where transmission lines don't. "The grid was not built for renewables," said Trieu Mai, senior analyst at the National Renewable Energy Laboratory." The disconnect is the capital costs for having a backup system for when the wind stops and the sun sets. Taxes on residential users. Same as Germany. Look at their industrial electricity prices. Lower than the EU27 average. Denmark 0.090 euros. Germany 0.086 euros. EU27 average 0.094 euros. I don't know about Denmark but in Germany a lot of their residential and commercial electricity price is for general fund taxes that the government collects. A big sales tax. And residential and commercial users pay all the renewable subsidies, industrial users benefit but pay nothing. In the US we don't put sales tax on electricity and we pay energy subsidies with income tax. Iowa gets 25% of its electricity from wind. South Dakota gets almost 25% from wind. The average price for electricity in their region (North West Central) is $0.1181/kWh. The cost of electricity in Iowa is $0.1186. The cost of electricity in Iowa is $0.1116. The US average is $0.1252. People can tell wild stories about how expensive wind is but facts pull the rug out from under them. They can even talk about the need for backup for when the wind isn't blowing. But they fail to mention that we backup all generation, always have. We've always had spinning reserve as backup. We're moving to storage. Yeah but if true then you simply decentralize and as much as you can ignore a grid that wasn't built for renewables. My confusion is more about squaring the cost of the energy from production to consumer. Yeah, but that's still 12 cents/kwh. I thought we were talking about lower prices than that. Is it the cost of other power sources in the mix that brings it up to 12 cents? That seems hard to believe, because in Kuwait the cost is 1 cent per kilowatt hour, and if I'm not mistaken their grid is run totally off oil. Correction, Kuwaiti production of energy is largely imported natural gas. If that isn't strange I don't know what is. Germany 0.086 euros. EU27 average 0.094 euros. 75+% of Germany's electricity comes from fossil fuels and nuclear. Germany saved 8 billion euros in fossil fuel purchases in 2012 due to wind and solar on their grid. If Germany's electricity is more expensive than the US's then one should look to fossil fuel and nuclear. That is what is making their electricity more expensive. You can't have renewables both cutting the cost and raising the cost. Kuwaiti - check to see how the government is subsidizing the cost of electricity. It's impossible to gen electricity with oil for a penny. Oil is more expensive than coal. Well, yes, that's basically what I was asking. Makes sense, and it would still be nice to see some clear numbers on the issue. The Kuwait numbers are a perfect example. There are no "clean" numbers out there AFAIK. There's always subsides, cost of import, refining, mining, land use costs, etc etc etc. I noticed something interesting on your Eurostat link. France was lower than quite a few other nations at .077 Euros. Isn't most of their power nuclear? And if you can figure out how to go back in time and build some reactors and pay them off then after they are paid off we could get cheap electricity from them. Electricity from a paid off reactor = 3c to 6c/kWh. Electricity form a new reactor = 16c/kWh. Take a look at the cost of electricity in Hawaii. 36c/kWh. They use mostly diesel, coal would be even more expensive as it costs more to ship. I think diesel electricity in India runs 25c/kWh (best check that number before using). In 2013 the average household electricity rate is about 29 € cents / kWh according to the BDEW (Energy industry association). So 8 + 6.5 or 14.5 euro cents go to electricity purchase and delivery. About 20 US cents. That's higher than the US 12.5 cent average, but about the same as New York state (19.57 cents/kWh). Interesting, I didn't know power companies changed rates based on how much they had left on their loans. That would be like a new supermarket charging $100 for a loaf of bread the first few years and then tapering off. It's a strange industry to be sure. Where rates are controlled by a regulatory agency, utilities present their costs and ask for a rate that covers their cost plus a reasonable profit. If they've got a lot of generation that still has to be paid off the rate will be set high enough to cover those costs. There were two pieces of news yesterday about this sort of stuff. Some sort of rate increase for Florida Power and Light having to do with their collecting money from their customers to be used for a future nuclear reactor. And an other piece about a rate increase in Ontario, Canada to cover the costs of refurbishing their older reactors. Georgia customers had their rates increased years ago to allow the utility to grab their money for the reactors now being built and will see another rate increase when/if those reactors come on line. The strategy generally is to stagger new plants so that when one is paid off another comes on line and uses the money freed.